These aren't really THAT old, really. They're just not the newest ones I've made (which I posted pictures of yesterday). All of these were modelled, cast, and painted earlier this year. Mostly in September and October. I thought I'd post them here as well for anyone that hasn't seen them yet. First is a 28/30mm British Infantryman advancing in tropical kit. Here's two battalions of them. The officers are from Coppelstone Castings. Next are some more pics of my 28/30mm 1920's Chinese Warlord Troops. A Regiment of four battalions (again the officers are from Coppelstone Castings). Chinese Cavalrymen. The horses are 25mm Hinchliffe from the Colonial Connection and the officer and his horse are, once again from Coppelstone Castings). Another view of the Highlander. Can anyone guess what Tartan I was trying to paint? A battalion of 1914 British Infantrymen. Two weeks ago I made some moulds for some new masters I finished up. These are five Canadian Great War Infantrymen plus an officer and another Chinese Infantryman. Here they are again without the barbed wire. Here is a size comparison with a few figures from some of my other favorite manufacturers. Left to right they are; a British Officer from Coppelstone Castings, one of mine, a British Tommie from Renegade Miniatures, a Highlander from Old Glory Miniatures. These are the Three Chinese infantrymen I have made. The new one is the one on the right, marching with his rifle slung. This is the state of the work bench these days. Lots of new masters on the go in various stages of completion. 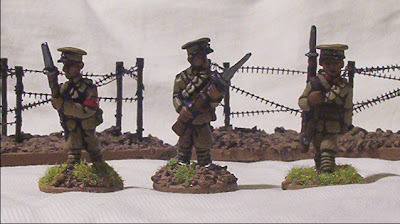 Some will become Great War Germans, some Canadian Highlanders, some more regular Canadians (lewis gunner, bomber, etc), and I'm even thinking about a few Pulp Adventure character type figures just for laughs. The Great War figures are the priority right now, though, as I have to get a bunch ready for the Vimy game I'll be running at May Day in Edmonton. A couple of you may have read this report. Now that I have this blog I thought I'd post it here as well. 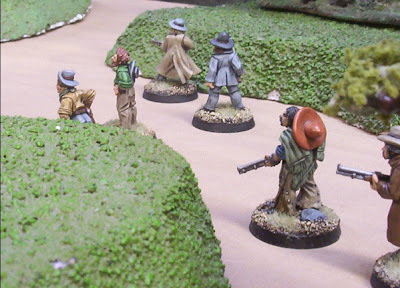 It is a report from a Savage Worlds Pulp Adventure skirmish game I ran a couple of weeks back. Abdul Mohammed Yang, leader of the ruthless "Orange Gang" a mob of chinese muslim bandits. 23 September, 1912. Sinkaing Province, North-West China. Captain Feng entered their camp and informed them that they were all under arrest by order of the Governor of Sinkaing for thievery, grave-robbing, sedition, murder and a load of other trumped up charges. They were to hand over all their arms and tools immediately. Daventhorpe doubted that Feng was really acting under the orders of the Governor and figured if they handed over their equipment they'd shortly end up in shallow graves. The riches of Chin'lin would make Capatin Feng a very wealthy man as he sold them on the black markets to private collectors. They would certainly never end up in a museum where they belong! So the members of the expedition stood their ground. The stand-off was broken when Captain Feng spotted some movement beyond the other side of the ruins. Peering over Daventhorpe's shoulder he cursed; "DAMN YOU BARON SMIRNOV!" Looking back Daventhorpe spotted another group of soldiers approaching from the west. These were Russian soldiers lead by Baron Vladimir Smirnov, an officer of the Russian Imperial Army posted to the Tashkent garrison and collector of Central Asian antiquities. His spies in Kashgar had informed him of the discovery and he lead a group of trusted soldiers covertly across the border into China. Unknown to any of them the entire encounter was also being observed by a group of bandits hidden on a nearby hillside. This is where everyone was dealt in. Unknown to the players there was also a yeti sleeping in his cave on one of the nearby rocky outcroppings. Any time a Joker was dealt I had them roll 2d6 on a 2 or a 12 the yeti would be woken by the commotion and would charge down off the hill and attack the closest figures. Arnold was dealt a joker but, being the ever cautious one, Darrin put him on hold. His wife penelope, going next with an ace, tried to shoot Feng (and missed) and made a run for the boxes of supplies! "Well that's torn it" says Arnold Smith and blasted Capatin Feng with his shotgun (who, in turn, soaked it...) then ran for cover behind one of the trucks. Abdul and his bandits opened fire and took down half of one of the squads of Chinese soldiers! 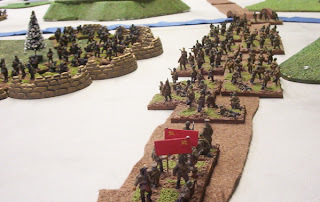 The Chinese soldiers then all ran for cover. One squad sought cover behind a ruined building and fired upon the diggers, taking down one of them. The other squad, or rather the REMAINS of the other squad, took cover behind a wall and returned the bandits fire with little effect. Then it was Blackmore and the Diggers turn to head for cover! They then started working their way around the building the chinese were hiding behind (on the other side). Feng finally went and took a shot at A. Smith as he dove for cover around the oposite end of the truck Smith is behind. Davis and Daventhorpe both shot chinese soldiers then split for cover in different directions. Daventhorpe joined Smith by the truck and Davis dove behind a wall of the ruined building opposite the group of Chinese soldiers. The Russians all advanced towards the ruins. One squad trying to flank around to the South. Another Joker helped Professor Daventhorpe blast another Chinese soldier. The shotgun helped too. You need all the help you can get when your shooting is d4. Davis and Feng, though in cover from the bulk of their respective enemies, realized they were in plain view of each other! Davis went first shooting Feng (who soaked but was rapidly running out of bennies!). Feng then maneuvered for better cover and shot back at Davis, missing. The Chinese and Bandits exhanged fire once again. Vladamir and the Russians dashed from cover to cover as they advanced upon the ruins. Arnold maneuvered around the truck and shot Feng, causing a wound! Penelope then joined the Professor behind the truck and fired her pistol at the Chinese behind the building, missing. Around the other end of the building Seth hobbled up to one of the Chinese soldiers and tried to bash him with his shovel. The soldier ducked. The rest of the diggers joined him, mobbing the remaining soldiers. Davis shot Feng causing two more wounds. Feng was in a bad way! He did, however, miraculously recover from being shaken (at -3!) but couldn't manage to do anything else. The Chinese soldiers in the melee by the building fought back! Their kung-fu and bayonets was no match for Seth or the diggers with shovels, however, as the turn ended with two shaken Chinamen! Smirnov finally maneuvered to a position behind the stacks of supply crates. He stood up tall and leveled his pistol at Daventhorpe and shouted "Give up proffessor, you can not hope to win". Daventhorpe, however, is unintimidated by this (both rolled 11 in their contest of wills!) and climbed into the truck and started it. Penelope climbed in the other door after loosing a shot off at Feng. Arnold also tried blasting Feng again but missed. Feng hiding behind the truck, surrounded by the bodies of his soldiers that have been picked off by the bandits. Daventhorpe and Smith are around the other side. Russians can be seen on either side at the top of the picture. One injured Digger lies out in the open where all the Heros started. In the immediate foreground is one of the Chinese from the squad that was shot up by the Bandits. He has taken cover behind the wall and is returning fire. In the background are the Diggers, along with their Foreman, Mr. Blackmore, fighting the other Chinese hand to hand. The Dead Chinese near them were shot by Daventhorpe and Davis. The Bandits on the hill. The flanking squad of Russians. The flanking Russians continued their trek while their leader, Vladamir, on the other side of the ruins shot at Davis, shaking him. Later in the turn the other squad of Russians (the ones with Smirnov) were finally in position and also fired at Davis. This time he took a wound he was unable to soak! Davis however super-recovered from being shaken sliped around the side of the building he is up against and pumped of a shot at the flanking Russians causing one to reconsider this foolish adventure ino China (shaken). Meanwhile Seth bashed in the head of a Chinese soldier with his shovel. The diggers finished off the other after the Bandits, firing into the melee, killed one. Daventhorpe threw the truck into gear and tries to back up over Feng. Feng rolled out of the way. Arnold pumped another shot into Feng as their respective cover rolls away, shaking Feng, then backed up to get some cover behind the pile of supplies. Feng couldn't recover this time. Penelope picked up Daventhorpes shotgun and reloaded it. 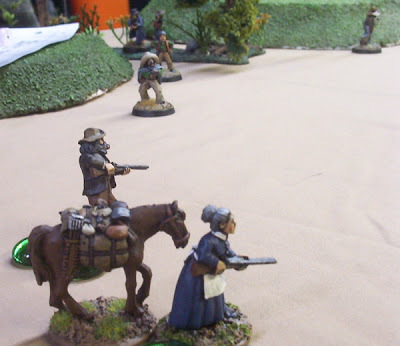 Left to right: Flanking Russians, one shaken by Davis, Davis in the hat shooting at the Russians, Mr. Seth Blackmore brandishing his shovel over the body of the Chinese soldier he has just brained, and Diggers finishing off the other Chinese. In the background can be seen the other Russians behind the stack of crates and in the ruins. There's a better shot of what's going on in the background with the Russians. Smith is behind the tent. Penelope leaning out the window of the truck blasted the remaining Chinese soldier. Daventhorpe having stopped the truck, gunned it forward to crush the shaken Feng against a wall. The truck, Davnethorpe and Penelope escaped injury in the collision. 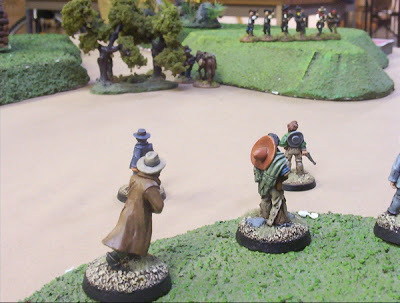 The Bandits lacking chinese to shoot at, killed two diggers! The flanking Russians charged Davis. He was stabbed with a bayonet but soaked it. Davis fought back with little effect. The two remaining diggers and Seth joined the melee with the Russians. Seth took one down as did the Diggers. Arnold draws his machete (handy those, in the desert...) and charged around the pile of crates and whacking one Russian soldier good. Two other Russians turned and joined in the melee, while the remaining three shot at the truck. Smirnov drew his sword and brandishing it above his head shouted: "You will die now, Smith!". Smith was not intimidated. The Russian's ego was seriously undermined and he decided not to persue this tactic of intimidation in the future. Smith (A.) took down one of the three Russians fighting him. They fought back while the others, again, shot at the truck. They must have gone to the Imperial Stormtrooper School of Armed Combat. Couldn't hit anything. Seth bashed another Russian with his shovel. The Diggers took one down. The Russians, fighting back, shook Davis. The Bandits shot up the truck as well, shaking Penelope. Smirnov jumped into the melee with Smith. He slashed Smith, shaking him. Daventhorpe backed up the truck. Smith battling Smirnov and Two Russians. Davis (right), Seth (center) and Digger (left) battle Russians. Seth took down ANOTHER Russian, the remaining two failed a morale check and were shaken. Davis took out one of them and the remaining one tries to surrender to the Diggers. Smith recovered from being shaken and took off Smirnov's head with one slash from his machete (SIX WOUNDS, only managed to soak one...). Another character that will not be returning. The other two Russians gave Smith a jab though, shaking him once again... The others shot at the truck. The Bandits shot into the melee with Smith and killed one of the Russians. The Digger decide they no time for tying up Russians and thus give no quarter. The bashed him to a pulp with their shovels. Davis dashed for some cover, followed by Seth. Bandits shooting into the melee finished off the last three Russians entirely missing Smith!!! Over the next couple turns all the heros loaded up into the trucks thinking they would drive out to the hill and face the Bandits. Smith even did a spectacular leap onto the truck driven by Daventhorpe as he lumbered by. On Turn 12, however, Abdul got a joker and shot Daventhorpe good through the front window of the truck. He took a wound and had to do a driving test to see if he could keep control of the truck. He failed. The truck veered right and crashed into the side of the wall they were just about to pass through. The truck was damaged, though the Smiths and Daventhorpe escaped further damage. 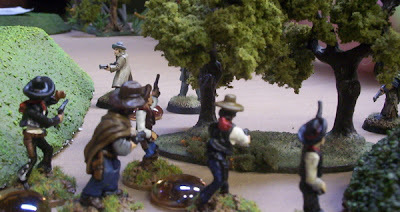 Last Friday's SHMW Game Night I ran a little Legends of the Old West game at the Den. I ran it for a couple of reasons. One was so that all the games for Novemeber and December didn't end up being WW2 games. Also I had recovered a bunch of my old west figures from Mr. Burt's basement when I went I was in Calgary for Fallcon and wanted to make use of them. These old west figures I speak of have a bit of a (boring) history. I ordered them all from England about 17 years ago. I think a couple were from Britannia Miniatures, the rest I haven't a clue. If anyone out there can tell from the pictures let me know. Anyway, I painted them up with intentions of playing some sort of old west shoot out game. I know John ordered Once Upon a Time in the West, and at some point I picked up some I.C.E./Rolemaster old West type game. But we never, ever got around to playing with them! 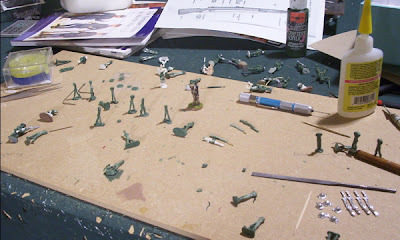 At some point, over a decade ago, I was purging miniatures and John took them and stored them in his basement until I came to my senses and asked for them back. 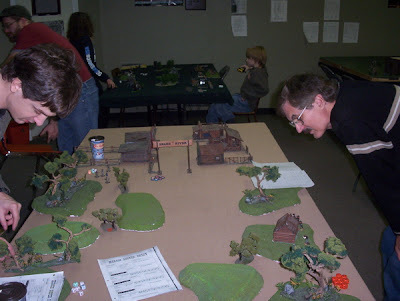 I decided these guys really needed to see some action so I said I'd run a LotOW game for the game night on 15 Dec 06. In the last couple weeks I rebased all and touched up some of the figures, and finished painting a few that weren't finished. Then I had to reread the LotOW rules as I hadn't even looked at them since I bought them when they first came out. Luckily Jeff showed up for Game Night as he has played it a few times and helped out when I forgot things (which was just about everything...). The scenario I cooked up was that the Brownville's, some hicks that live up in the hills near Snake River, had found some gold on their property. Now the Brownville's aren't trusting folks and usually hide all their money in old coffee cans but there was a significant amount of gold in the vien they discovered so they made arrangements for the Bank in Snake River to hold it for them. Well word kind of got out and a couple of interested parties set out to ambush the Brownvilles on their way into town and make off with their gold. I played the Brownville's; Ma, Pa, Billy-Ray, and Jethro. These are more recent additions to my old west collection. They're Coppelstone Castings "Sharp Shooting Hillbillies" from the Gangster line. I used the cowboy list to make them up, I didn't buy them wilth points/dollars, I just used the list for the stats. Their goal was to lead the mule laden with gold into snake river and turn it over to the Sheriff and his deputies that were waiting at the bank. I also played Sheriff Johnson (one of the ones I think I got from Britannia Miniatures) and his two deputies (a couple more recent additions; Artizan's "Gothic Gunfighters"). I made up a couple groups of outlaws with my older figures but only ended up using a one of them which Gary played. Dylan (left) and Gary (right) check out the lay of the land, and are setting up their posses. The Brownvilles started at the table edge furthest from Snake River, which can be seen in the distance. Jeff (hiding behind Dylan) later set up his posse on the same side as Dylan, but closer to Snake River. Here is Ma and Pa Brownville. Jethro and Billy-Ray are trailing behind as they've been shooting up some of Dylan's Outlaws (seen in the background). Now these are some of those ancient Old West figures of unkown origin played by Gary. Gary maneuvered them through the gullys and tried to make best use of the cover available (and let Dylan and me and jeff shoot each other up a bit before jumping in!). Sheriff Johnson of Snake River and his Deputies. They didn't play much of a role in this scenario. 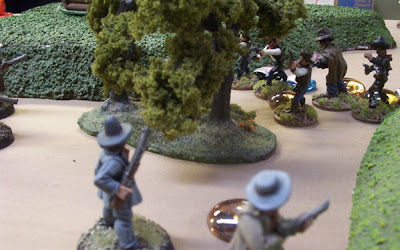 armed only with six-guns their sole purpose was to distract Jeff for a turn or two while catching a few bullets from his rifles. 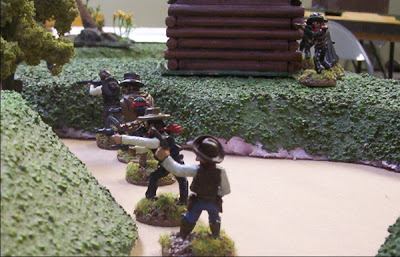 Jeff's Rangers shot down the two deputies then Sheriff Johnson decided to head for the hills. Some of Jeff's Rangers. Some look like Mexicans to me. At this point Ma's been shot down and Pa's grabbed the mule. Snake river is in sight (as are the Lawmen just beyond the Snake River sign). Jeff's Rangers are up oon the hill. I think Dylan's Outlaw's (not in this picture) were already making "Head for the Hills" checks and passed them for about 6 turns in a row before finally calling it a day. The turn after this picture was taken the rest of the Brownville's went down. Jeff's Rangers on the hill looking across at Gary's Outlaws that have recovered the mule. Gary had been going dead last every turn up until we had to check for where the mule went. The player with "the drop" determines where bolting animals go. So of course Gary got the drop, the animal bolted, and headed straight for Gary's group. At this point Jeff and Dylan forged a (temporary) alliance, otherwise Gary's Outlaws would turn and head off the table while they continued to shoot each other up. Jeff then shot the mule. The mule was replace with four gold tokens. Where the mule could be lead at a walking pace, each gold token had to be carried by a different figure, which could onl move at half rate when carrying said gold and could only use single handed weapons. So Gary picked up a few of them and headed for his table edge. Jeff and Dylan's guys chased him across the table shootin' as they went. Eventually Dylan's guys decided they'd had enough and called it quits. A couple shots of the final shoot out between Jeff and Gary's posses. There was a lot of fanning of six-guns going on and guys dropping like flys. In the end both were below half strength and I think it was Gary's guys that head for the hills first. Another fun game. Thanks to Gary, Jeff and Dylan for coming out to play! If I were to do it all over again I'd probably've used Savage Worlds. I'm far more familiar with the system and could have tweaked things a bit better to make the Brownvilles a tad more survivable. Each would have been a wild card (or at least Ma and Pa and Jethro and Billy-Ray would have been really tough extras), whereas the players would have had a single wild card leader and a group or two of extras. 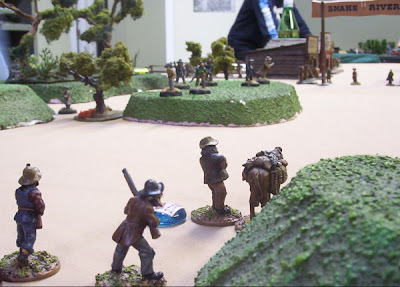 Just to try this out I thought I'd start with a report on a couple of games played recently at the Saskatoon Historical Miniature Wargamers Games Night. 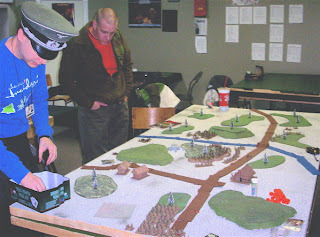 On 5 Dec 06 Mr. Miller ran a Flames of War game. The scenario was based on the new Roadblock scenario in FoW v.2. A Russian company column was marching up a lonely road (or, rather, what they HOPED would be a lonely road) across the snowy Northern Finnish wasteland. Little did they know there were German Gebirgsjager waiting in Ambush. Instead of counting points Mr. Miller just grabbed whatever Russians and Germans he had in his vast collection that might be found on or around a lonely road in Northern Finland during the Second World War. A new fellow also joined us to try out the game. I think his name was Clint? He played the Germans along with Mr. Miller. Here is my Russian Column about to be ambushed. You'd think my scouts that had gone on ahead would have noticed those massive fortifications the germans built in the woods there. Perhaps they've been hitting the vodka again. Hiding in that wood was a full strength German platoon with two HMGs atached and a spotter for his mortar platoon. I think he threw 28 dice at me when they fired. Many russians died. And they were pinned. And, "fearless" though they were, hey refused to get up and assault those germans in the woods for a few turns. Eventually they moved up but never did get to assault. Each attempt was thrown back and they eventually broke and dispersed. Here's those scouts I mentioned. they were further up the road and started back to help out. they briefly contested one of the objective markers but were eventually overrun by bold German Gebirgsjagers with SMGs (there was the platoon command plus the company command and 2IC; all command SMG teams). Mr. Miller, who came straight from work, borrowing my Heer officers cap for the night. I was dissapointed he didn't bring his furry russian hat for me to wear... also in the picture is the new fellow (Clint?....sorry if that's not your name...!) friendly guy, I hope he comes out to more games. Here is the second Russian Company arriving as reinforcements. they were pinned first by mortar, then by MGs, and also refused to get up and get going for a couple turns despite many executions by the company commisar. Eventually the original ambushing platoon rushed the building my battalion commander had taken cover in (which, I think was also one of the objective markers..?) and killed them. As I mentioned a second platoon of Germans wiped out the scouts that were hiding in the woods by the bridge which was the second objective marker. My second company just couldn't get going fast enough to get anywhere near either objective before the sixth turn. I had some Regimental guns come on at one point that tried to have a little artillery duel with the Gebirgjagers mountain guns. The Russians, however, were wholey outclassed and ran for cover lest they all be destroyed. Thanks to Mr. Miller for running that! Welcome to Tim's Miniature Wargamming Blog. Here you will find reports (and pictures!) of games I have played as well as news (and pictures!) about my current modelling and painting projects.